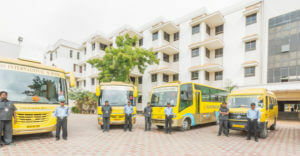 The school offers temperature controlled transport facilities for its students. The speed limits of the buses are fixed for the purpose of safety. The bus also has Monitors which show case Educational videos. Each bus has a bus attendant and a teacher travelling along with the students. Edify Schools with the motto ‘Leading Young India’, are an epitome of excellence and quality in education in the country, known to mould traditional values into a contemporary, real-world context. MDN Edify Education (P) Ltd, Campus, Survey No. 523, Opp.Apparel Park, Gundla Pochampally, Medchal Mandal, R.R. District, Telangana, India - 500 100.